At a time of increasing polarization between religions, a London exhibition shows that history tells a different tale. Focusing on Albanians saving Jews during WWII, it looks at stories of solidarity and compassion. Muslims and Muslim organizations have condemned the actions of the extremists in Libya and Egypt. See the collection of statements here. They have expressed their sadness for the loss of innocent life. There is no “appropriate” target for terrorist acts. Scholars, sheikhs and notable Yemenis attend a conference for scientists in Sanaa on Sept. 19, 2012. The Holy Land is a land of trauma. Old hatreds and fears cling to the Israelis and Palestinians like skins. Here is my Israeli patient, a scar in his side from a Palestinian bullet; my Palestinian friend, shot in the leg by an Israeli soldier; the Bedouin family whose home, made of scrap aluminum, was demolished by Israeli bulldozers; the Palestinian teenager sent to prison for throwing rocks at soldiers; and the Israeli soldier whose job was to interrogate arrested teenagers. Until the sharp pain that runs through the heart of Israel/Palestine is acknowledged, nothing can change. As part of a drive against growing extremism, Islamic scholars gathered in Mauritania to share their moderate vision. Central to the achievement of the “Zionist dream” is the notion that Jewish lives matter more than Arab lives. Until this vast injustice is acknowledged and reparations made, there will be no authentic reconciliation and lasting peace. The children of the Holocaust must make the first move in this case—and move beyond the bitterness of all subsequent violent backlashes. This really did happen and the denial of it is a fundamental obstacle to healing. When nations deny their past, the trauma continues. The Armenian Genocide is still denied by the majority of Turkish officials—but some inroads have been made. JERUSALEM (AP) — Proposed legislation to permit the force-feeding of Palestinian prisoners on hunger strike is pitting Israel's government against much of the country's medical community, including the main doctors' association which contends the practice amounts to torture. Last week, Tariq Abu Khdeir, the Palestinian-American teen beaten by Israeli police, and his mother testified at a Congressional briefing. US Senator Barbara Boxer interrupted powerful Palestinian testimonies of abuse and discrimination airing live on CSPAN to agitate for greater US support for Israel. How can a preventable war be justified? And how can one wrap oneself in its rightness in the presence of the horror-show images from Gaza? Social media connects people in the warzone to the outside world. But we will always need truly independent journalismMost nights in Gaza my hotel's power went off but the Wi-Fi didn't. Here's what you need to know to understand the ongoing violence. A supporter of Israel's campaign in Gaza evades a longstanding taboo, using logic uncomfortably close to what's employed by Palestinian and Al Qaeda terrorists. A Palestinian boy walks through the rubble near a mosque destroyed in an Israeli airstrike the night before in Gaza City, July 23, 2014. The two sides complement each other in tarnishing Judaism with a historical moral stain that will be difficult to expunge, and in the process they are destroying Israel. Frank Callery - Norman Finkelstein refuses to play the Holocaust card in the face of Israeli brutality towards the Palestinian people. There is no way to turn off the disc in my head that says our governments won’t find peace for us because they don't care about us. We, Israelis and Gazan civilians alike, must break the cycle. In this interview, dissident Israeli historian Ilan Pappe discusses current events in Gaza, the effectiveness of the BDS movement, the possibility of a two-state solution and the progression of racism within Israel. One is Israeli and is currently on the ground overseas. The other is Palestinian and has family in the Gaza area, as well as all throughout Palestine. Glenn Greenwald: I’ve gotten to understand a lot more about how these large media outlets function. I’ve worked with some of them over the last year in the reporting I’ve done. Prestigious, mainstream journalist says what others are afraid to. The violent behavior of the soldier videotaped aiming his rifle at a Palestinian teen, setting off a storm in the media, especially the social media — was not exceptional. Wanton destruction of 1500 apple and apricot trees gets global attention. From the Tent of Nations near Bethlehem: "Today at 08.00, Israeli bulldozers came to the fertile valley of the farm where we planted fruit trees 10 years ago, and destroyed the terraces and all our trees there." JERUSALEM — There is a pleasant fiction in the United States and parts of Israel that the Israel-Palestine conflict exists in a sort of suspended animation, on pause and simply awaiting diplomatic resolution. An 18-year-old Palestinian was shot dead by Israeli troops during a raid of Jenin refugee camp in the northern West Bank early on Tuesday, Palestinian security and medical officials told AFP. Official statistics from the Ministry of Information in Ramallah have revealed that 1,518 Palestinian children were killed by Israel's occupation forces from the outbreak of the second Intifada in September 2000 up to April 2013. Israelis Kidnap Palestinian Boy and Burn Him Alive. Enough. Instead, it was some guys acting as a rogue lone cell! Nobody pays attention to the settlement project or thuggish incitement when there are air raid sirens in Jerusalem and Tel Aviv. Some are observing a generational shift as Jewish youth in Israel express a distinct anti-Arab attitude that wasn’t learned in the home. Israel and Hamas stumbled into this bloody confrontation due to a series of mutual missteps. It started with a triple murder and a clever fib, J.J. Goldberg writes. Two explosions struck an area that had been considered relatively safe from the intense Israeli bombing campaign. A well-known Israeli MP says mothers of all Palestinians should also be killed during the Israeli assault on Gaza. My voice is only one of millions suffering through the nightmare in Gaza. Is anyone out there listening? Why does the US ignore the plight of Palestinian Christians under Israeli occupation? Last summer’s war in Gaza was the clearest indication yet of how the IDF has been moving from the secular to the religious, with former chief of staff and current Defense Minister Moshe Ya’alon at the heart of the change. Amnesty International says Israel displayed ‘callous indifference’ in attacks on family homes during military campaign in Gaza"
GAZA CITY, Gaza Strip (AP) — When an Israeli airstrike hit the Gaza home for the handicapped where she was staying, Sally Saqr was left shattered. Her pelvis, both legs and an arm were broken, her skull fractured, much of her body burned. Sara Roy of the Center for Middle Eastern Studies at Harvard University describes the deteriorating conditions in Gaza. Funds to repair more than 100,000 homes across the Gaza Strip have been halted. 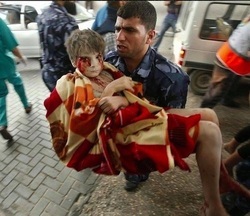 Children in Gaza have been consistently targeted by Israeli forces. GAZA/JERUSALEM (Reuters) - Gazan authorities said Israeli forces shelled a shelter at a U.N.-run school, killing at least 15 people, as the Palestinian death toll in the conflict reached 796 and attempts at a truce remained elusive. 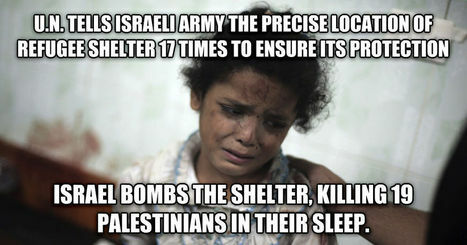 Stop killing children in Gaza, Bibi. Stop it now. In Gaza, close to 2 million people live so densely packed that any strike will kill someone more than the target. And that someone too often is a child. Farah Baker is a Palestinian teenager who tweets her day-to-day life in besieged Gaza, posting live video footage and audio clips as rockets fall on the strip. UNICEF asked children to draw what they think the future of Gaza looks like. Their drawings capture the hopes and dreams that everything will be all right in the end. The summer conflict between Israel and Hamas had an extraordinary effect on kids. Here are the reactions of 8. At least 296 Palestinian children and adolescents have been killed since Israel launched its offensive in the Gaza Strip against Hamas on July 8, the UN said on Saturday. "Children make up for 30 percent of the civilian casualties," said the UN children's agency UNICEF, adding that the toll was based on deaths which it was able to verify and was likely to rise. UNICEF stressed that its figures are "cross-checked to the best extent possible in the current situation... subject to change based on further verifications." "Between 8 July and 2 August 2014 (up until 11:00), at least 296 Palestinian children were reported killed as a result of airstrikes and shelling by Israel aerial, naval and ground forces," it said.